Unknown; compare Old English bindele (“a binding, a tying”), and bundle. (now Scots) Any given length of cord, rope, twine, etc, used to bind something. 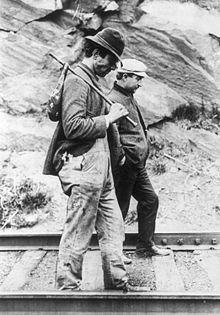 The front hobo carries a bindle on the end of a stick. Probably a corruption of bundle; perhaps influenced by bindle. (US and Canada slang) A bundle carried by a hobo (usually containing his possessions), often on a stick slung over the shoulder; a blanket roll. (US and Canada slang) Any bundle or package; specifically one containing narcotics such as cocaine, heroin, or morphine.